Proposed land uses within the Plan include mixed-use, community retail and lifestyle centers (including local and national retailers); business campus commercial; research and development campus (es); and, civic, cultural, arts and recreational facilities, together with select transportation and gateway improvements. Approved by the Colorado Springs City Council on December 14, 2004. The North Nevada Corridor Urban Renewal Area is located in central Colorado Springs in the northern segment of the North Nevada Avenue Corridor. The area is bounded by Monument Creek to the west and the I-25 – North Nevada Avenue interchange, including several commercial parcels located along the interstate frontage road, to the north. The Study Area’s eastern border is quite irregular, but generally includes a significant portion of the UCCS campus located along North Nevada Avenue including all properties contiguous to the corridor (to the east) and once removed. The intersection of Garden of the Gods and North Nevada Avenue, including properties in the southeast and southwest quadrants then form the southern boundary. The western boundary is generally formed by the Monument Creek corridor. The purpose of the North Nevada Avenue Corridor Urban Renewal Plan is to reduce, eliminate and prevent the spread of blight within the Urban Renewal Area and to stimulate the growth and development in the corridor over the near- and long-term. 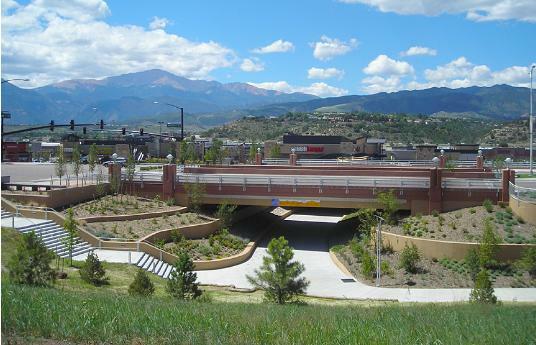 Specifically, the purpose of the Plan is to promote a mix of uses which leverage community and institutional investment in the corridor and creates linkages to surrounding natural amenities, neighborhoods and educational institutions in accordance with the 2002 Colorado Springs Comprehensive Plan and North Nevada Avenue Corridor Reinvestment Study. Designated an Employment Center and given its relationship to the UCCS campus, and proximity to the Burlington Northern Railroad corridor, this area has been designated for employment center uses including research and development. Opportunities would include a range of office, light industrial and research and development products with supporting commercial space. Users would be targeted to those who desire access to an institutional anchor such as UCCS. Designated a Commercial Center this area’s full development could include major region-serving commercial uses, connected to higher density residential products located in the corridor, as well as the existing trail system. While private interests will provide the framework for new development, an increase in density of uses would be compatible with existing adjacent uses to the south and west and continued development of the UCCS campus. Designated a Community Activity Center this area will be promoted for a mix of office and commercial uses, retail, entertainment, lodging, parking facilities, and high-density residential complexes, consistent with the intensity and character of urbanized commercial corridors. While existing uses will influence the character of early redevelopment (and development) projects, opportunities to maximize building height and massing, provide architectural diversity, and deviate from historic themes are perhaps greatest here. Physical, visual and pedestrian linkages from the corridor to Monument Creek and other open areas will help establish this area as the southern “gateway” of the Urban Renewal Area. 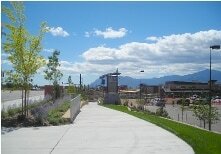 Adjacent to the UCCS campus and existing region-serving recreation facilities and supportive parking, this area of the Urban Renewal Plan offers the greatest opportunity for public recreation, open space, public art, public buildings and urban spaces, and pedestrian linkages to City trail systems. Note: Existing recreational facilities could remain or be replaced to accommodate this redevelopment scenario. Adjacent to the I-25 corridor and Research and Development campus, this area of the Urban Renewal Plan offers the significant opportunities for commercial development. This area will likely experience gradual redevelopment and as such, will benefit from standards constraints in terms of architectural style – establishing the corridor’s image and theme within a gateway setting. Features will include “gateway” signage, professional office and business uses, lodging, community and campus services-oriented uses, urban treatment scale and character.